Stopping problems before they can start is vitally important when it comes to your home heating system. Summer has just ended, and the winter months will catch up to us in Ohio before we know it. Don’t let the autumn slip past without taking the time to give your heating system the care it needs to prepare for winter. One of the surest ways to prepare your heating system for the icy season is regular, professional maintenance—it’s the best way to avoid having expensive repairs done at a time when you most need warm air circulating through your home. 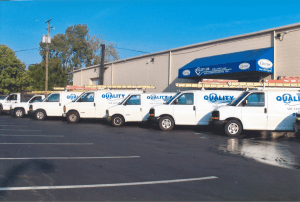 If you want to enroll in regular maintenance, contact our Columbus, OH heating repair specialists at Quality Air Heating and Air Conditioning. The most important way that maintenance can help prevent costly repairs is by reducing the wear and tear on components. If your system is not running efficiently because of a defect, it has to compensate with more power in order to generate the amount of heat you need. The harder it works, the faster it wears down. This means increased heating costs as well as repairs that could have been avoided. If you have an older system, such as one you inherited with your home, it is especially important to schedule regular maintenance. You may not be ready for a replacement system, so scheduling maintenance is the best way to keep an aging system working its best for you. Maintenance will also keep your heater clean. Cleanliness isn’t only an issue of efficiency and air quality. Debris that gets caught in ducts can cause damage that will eventually require repairs. Routine maintenance will help identify these problems and keep your system free of obstructions that might create problems. Even with regular annual or bi-annual preventive maintenance, there will come a time where your heating system will require repairs. For your own safety and the safety of your family, don’t try to make these fixes yourself. A trained HVAC technician will need to do the work. For heating repair in Columbus, OH, look to Quality Air Heating and Air Conditioning to take care of your maintenance and identify any work you may need done before winter.